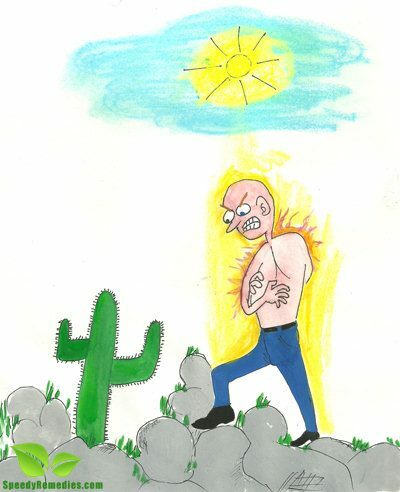 Heat Rashes are characterized by small red bumps on the skin that tend to develop on the neck, abdomen, upper chest, back, underarms and other parts of the body mostly covered with clothes. As the name itself indicates, the condition is caused by extremely hot and humid weather and also known as Prickly Heat or Sweat Rash. It is called Miliaria in medical terms. The main reason behind the formation of Heat Rashes is clogging of pores present on the skin, thereby causing blockage and swelling in the sweat ducts. As babies tend to have smaller pores as compared to adults, they are more vulnerable to this problem. However, as this is a common ailment, there exist a number of Heat Rashes natural treatments in the form of natural home remedies for Heat Rashes. The home treatment should also be supported with various precautionary so as to avoid aggravation and recurrence of this harmless but annoying problem. More often than not, Heat Rashes tend to resolve within four to five days. Hot and humid weather of tropical climates usually gives rise to Heat Rashes, especially when wearing tight-fitting clothes that trap sweat and do not allow the skin to breathe. This leads to clogged skin pores which do not let the sweat escape from skin causing Skin Irritation, eventually resulting in the formation of Heat Rashes. Factors like excessive sweating, obesity, high fever, being over dressed, wearing nylon clothes and engaging in highly strenuous exercises can contribute in causing this problem. Bed ridden patients and individuals suffering from congenital decreased or nearly absent sweating are at an increased risk of developing this problem. Appearance-wise, the condition looks similar to a cluster of small blisters on skin. Besides, redness, itching, stinging sensation and mild inflammation are the most common symptoms of Heat Rashes. These tiny red bumps often form on areas with skin folds, for instance, neck, armpits, creases of elbows, under breasts, groin etc. Presence of such rashes in case of children indicates overheating that can further give rise to issues like heat exhaustion and even heat stroke. At times, negligence towards these rashes, may give rise to infection and pus formation. Therefore, it is better to cure this problem with the help of simple and inexpensive Heat Rashes home remedies in the beginning itself to control this problem easily at home. • Application of ice packs for about 5-10 minutes at regular intervals is one of the most common natural home remedies for Heat Rashes treatment at home. Ice tends to cool and soothe the irritated skin and avoids the condition from getting worse. Make sure you do not apply ice directly on the skin, instead crap it in a soft cloth or towel. Having frequent cold baths also reduces this irritating problem to a great extent. • Wash the affected area and apply some aloe vera gel on it to cure Heat Rashes naturally. Repeat this simple therapy about two to three times in a day to get rid of Prickly Heat. • Applying small amounts of cocoa butter also serves as a good Heat Rashes natural remedy. However, do not overdo this remedy because this substance is quite greasy. • Prepare a paste by adding a teaspoon of sandalwood powder in two tablespoons of rose water. Smear it on skin and wash it off with cold water when the paste dries to provide cooling effect on skin and ease the discomfort. You can also add a pinch of powdered alum in this mixture. • Applying a paste prepared by mixing Fuller’s earth and water facilitates the process of healing. Moreover, placing cool chamomile tea bags on skin also helps soothe Heat Rash. • Taking an oatmeal bath for 10-15 minutes is one of the most highly recommended natural home remedies for Heat Rashes and various other types of rashes. This oatmeal home remedy works best when colloidal or finely ground oatmeal is used. • Dusting absorbent powders such as baking soda, cornstarch or mild talcum powder on skin helps a great deal in reducing and preventing Heat Rashes considerably. These powders provide relief from prickly heat by absorbing excessive moisture from the skin. • When dealing with Heat Rashes, it is often recommended to let the skin dry in air rather than drying it with the help of towel. In addition, avoid scratching the rash and apply water based moisturizer in case the condition is accompanied by skin peeling. Needless to add, avoid heat and sun exposure as far as possible. Having a diet rich foods containing vitamin A, vitamin C, vitamin E, zinc and various other essential nutrients in is highly beneficial for reducing and healing Heat Rashes. In addition, it is advisable to consume foods with high water content such as cucumber, watermelon, orange, papaya and so on to avoid Prickly Heat. Moreover, regularly drink sugarcane juice during the summer months. Adequate intake of water and limited intake of alcoholic and caffeinated beverages is an essential prerequisite to prevent Heat Rashes and numerous other skin issues. Apart from adopting these dietary suggestions and natural home remedies for Heat Rashes, try to wear comfortable cotton clothes instead of nylon or polyester ones during summer months because cotton is a breathable fabric that tends to absorb moisture, thereby reducing the chances of developing this irritating skin problem.